Penn Football overpowered South Bend St. Joseph, 30-14, on Friday, Sept. 22, to improve to 5-1. Senior Brock Zolman would get the game’s first points on the board with a 2-yard TD run to put the Kingsmen up 7-0. James Morris then hammered the St. Joseph quarterback for a safety. On the next Kingsmen possession, QB Ryan Lynch blasted 38 yards for the TD to put the Kingsmen up 16-0. St. Joe would finally muscle points on the board on their next drive to make it 16-7 Kingsmen. 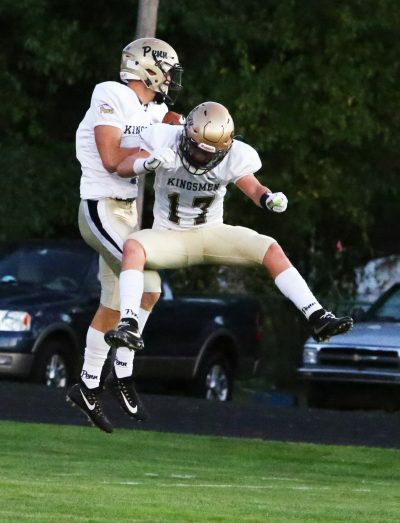 Ryan Whiteman punched into the end zone from the 2 and the Kingsmen pushed their lead to 23-7. On the kickoff to open the second half, senior Paul Moala slashed through the Indians for a 98-yard kickoff return to put the Kingsmen up 30-14.